Here’s something you should know about the average person: they don’t want to pay for your software. Okay but that was over ten years ago Shane, people have changed. No, the problem seems to continue to get worse. Recently, Andrey Asimov released Progress Bar – an app that tells you how far we’ve progressed through the current day, month, or year. But you aren’t just wrong, you’re completely and utterly wrong. If you were to say: “The utility of this app is not worth $5 to me” that’s fine (and I may even agree). But if you ever wanted to have this exact utility available on your computer, you’d be hard pressed to create it, or have it created for less than $5. This, is where the problem lies. There is a basic economic principle – you buy things because you think the value of using it is greater than the cost of purchasing it. This is known as perceived value and when it comes to anything on the internet, we’re completely thrown off. Part of this is because the large majority of our time (70% to be exact) online is spent on a mobile device. 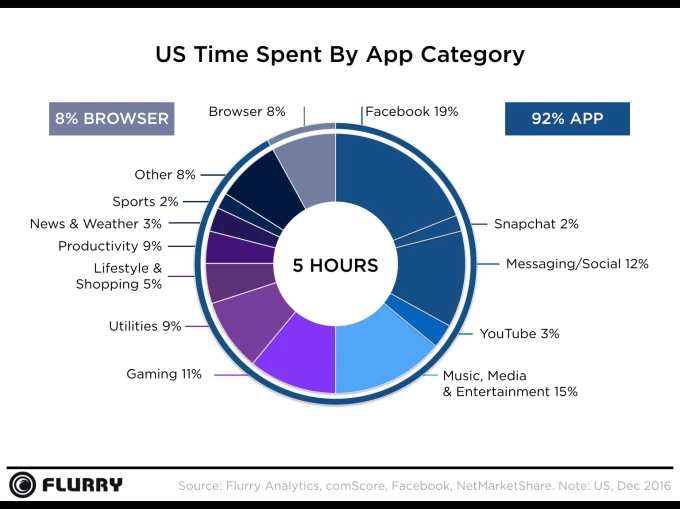 Of the time we spend on our phones, 33% of the time is on social networks, another 11% of this time is spent playing games, and another 15% of this time is spent on general media and entertainment. What do these apps all have in common? Here’s another way to think about it: When you try to brainstorm a list of mobile apps, what are the first 5 that come to mind? What about the first 10, or 15? I bet those are all free to use too, if not >95% of them. Of course this is inherently a good thing for you as a user. But, we need to accept that this trend is partly responsible for why Gartner predicts over 99% of apps will lose money this year. If you’re an indie app developer you know the value of earning revenue. If you’re a startup founder and you’re hoping to take advantage of some inexplicable network effect I’ve got news for you, revenue is cool these days. Burning through cash and your sanity with no end in sight is not. Don’t forget, this is including all the apps that are monetizing through micro-transactions, and those “selling” your data to advertisers. Both are practices that are generally frowned upon by users *cough*Facebook*cough*, but nonetheless don’t ‘cost’ users anything. I’m going to make a sweeping generalization here: mobile apps are the most common form of consumer software there is. (Remember the stats above? 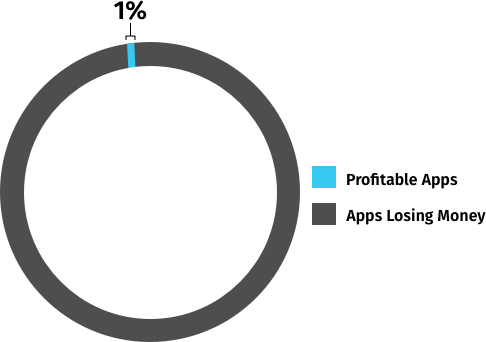 70% of our time online on our phone, 90% of that time on mobile apps.) That’s why the rest of this article is going to focus on monetizing mobile apps, but the same is generally applicable to web. Note: Consumers want your software to work on Web, iOS, and Android. We build hybrid web and mobile apps that make this a reality with 50% less time, money, and code. If you have a project in mind, let’s talk. I know you’ve heard of it before. Freemium is a pricing strategy where you offer something to your users for free, with the option to upgrade to a paid subscription for enhanced functionality. Why does freemium work so well for mobile apps? It turns out getting someone to download your app is hard enough when it’s free. That simple commitment of entering your password can be enough to make people second guess if it’s worth it. Now imagine if you add a price tag to that app. Even $1 is a hard price to pay for an app that you don’t get to try before you buy. To make matter worse, 51% of people don’t download a single app each month on average and 66% of people buy zero paid apps per month. It’s no surprise that the most successful apps in the world are free, but with strong upsells that follow. Your number one goal with mobile apps is to get someone to download. Then, you need them to actually use your app. That’s why the trial to upgrade freemium model works wonders. Arguably the most successful example of this model can be seen in the app Headspace. 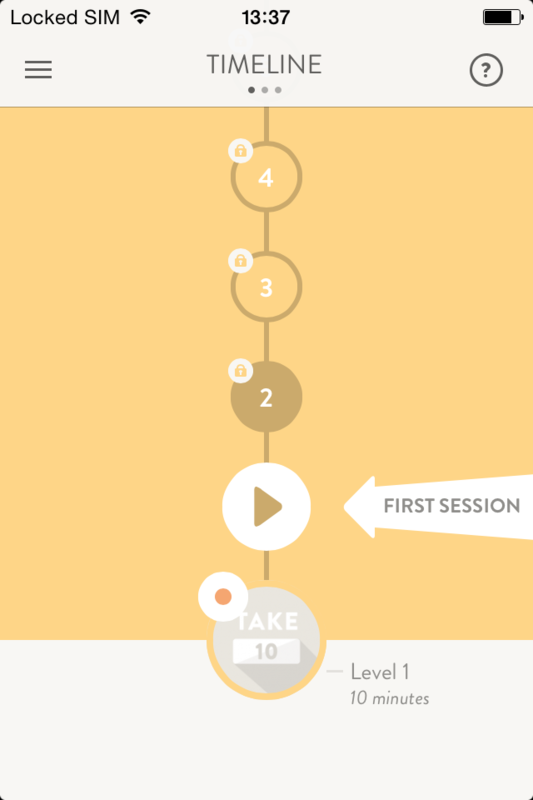 Headspace is meditation app that allows you to choose between 10, 15, and 20 minute meditation sessions where Andy Puddicomb and his incredible voice guide you through the practice. In order to allow users to try their app before getting started, they created the “take 10” program. Which is a 10-day meditation challenge that allows you to try out the app while helping you build a habit around the practice. After you complete the challenge you need to subscribe to a $12.99 / month subscription in order to continue practicing. The take 10 challenge removes any barrier to entry for people to download the app (because it’s free), let’s them experience exactly what the app has to offer, and has a clear path to monetization. This is arguably one of the most effective on-boarding campaigns in mobile and has lead to over 11 million app downloads and 400,000 paid subscribers. The most common form that freemium takes is the “free but restricted use” model. This is where an app puts some of its most desirable features behind a paid subscription. A great example of this in action is Spotify. Spotify is a music streaming app with one of the largest collections of music available online. 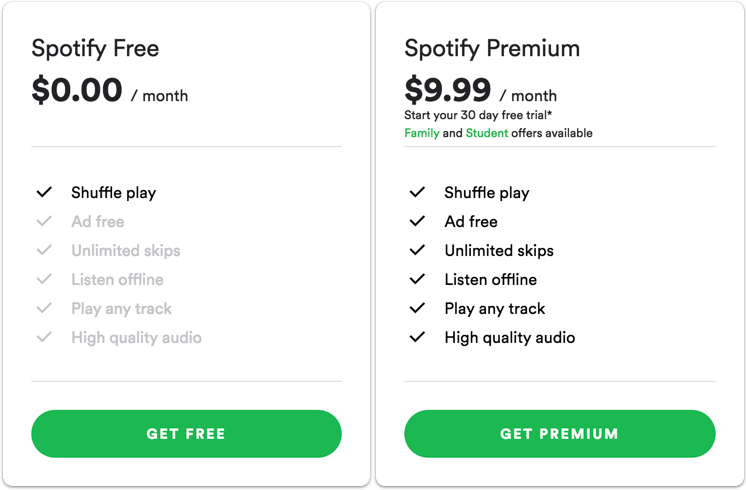 Although there are some awesome features that spotify premium offers, their core value proposition is their library of music that you can search through to find your favorite artists. Knowing this, they give you full access to all of their music absolutely free, no questions asked. Though, while listening to music you may be interrupted by ads in between songs, only able to skip over a few songs each day, and you don’t have the option to select the exact song you want to hear. Whereas with Spotify Premium, all of these features are made available to you for $9.99 per month. For Spotify, this business model (among other things) has put them on track to earn $4.9 Billion in revenue in 2018 and they’re now a publicly traded company . Building an app that encourages interaction between your users is always going to be better off being free. Not free like Spotify, I’m talking completely free. Letting your users have access to every feature available is a great way to make them fall in love with your app. There’s only one problem here, you still need to make money. One option you have is to sell advertising on your app and make a small commission each time someone clicks. This may be viable for you, but will probably end up aggravating your users in the long run and push them to drop your app. Depending on your business, a better option could be using the “pay to win features” freemium model. With this model, users have complete access to your app except for a few game-changing features. You’re not restricting users in any way as they can still get a ton of value from your app, you’re just helping paid users “win”. A great example of this model in action is Tinder. With tinder, anyone can download the app, make a profile, and swipe in hopes of finding a date. I’m pretty sure you’ve heard of Tinder, but if you need more of an explanation, head to their website. Everything you do within tinder can be done for free. You can swipe, chat and find a date without spending a dime. But if your an opportunist (or desperate) there are paid tears that allow you to turn things up a notch. 5 super likes a day – super liking another users lets them know that you’ve liked them, whereas regular likes don’t. Hide your distance – if you’ve got a long commute into the city, but don’t want anyone to know, you can hide your distance from your profile. There are other features too, but this is the bulk of the value. With this freemium model, Tinder was able to add 1.5 million paying subscribers in 2017. I wish there was a way for us to change the narrative around software and make people appreciate the work that goes into the things we build. But, chances are that’s not going to happen. We can choose to be romantic about it or we can adapt to the market and learn to up-sell users on premium versions. Granted, the freemium model isn’t the only way to find success with a mobile app, but it’s by far the best way to build a profitable and sustainable consumer software product in 2018. If you disagree, feel free to come join the discussion with me on the Growth Hackers thread. And of course, if you want to de-risk your consumer-facing software project by getting to market faster, building an omni-channel experience, and cut development costs by 50%, let’s talk.